SweetVinyl wants to make your old records sound like new records | What Hi-Fi? The SweetVinyl SugarCube removes extraneous clicks and pops on records in real time, without damaging your vinyl. Vinyl's popularity is growing strong, as proven by its recent overtaking of MP3 sales. However, one of the problems with a record's sound quality can be the numerous pops and clicks that are sometimes heard during playback. That's where SweetVinyl's SugarCube, an Indiegogo campaign to bring out a device with a built-in noise-reduction platform, comes in. The algorithm detects unwanted noises, isolates them, and removes them in real time. The inputs to the SugarCube are line level, so the unit can be connected to your existing record player (unless it's the little, portable RokBlok). There are two versions of the SugerCube, the SC-1 and the SC-2. 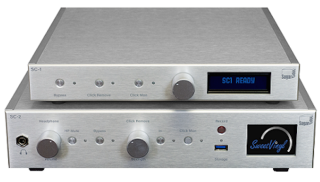 The former supports digital processing at 24-bit/192kHz, and allows listeners to choose between the cleaned output or raw input of the vinyl. The SC-2, while including all the functionality of the SC-1, also lets you record onto the device, create digital file formats of your records, and gives metadata information about the vinyl that's playing - such as the song and LP name. You can back the SugarCube on Indiegogo for $400 (approximately £330), with worldwide shipping predicted for February 2017.